Lilly Pilly Bush Christmas is ideal for shaping or a dense hedge. Can be kept pruned to a height of 1mt, making it ideal for low border hedging. In winter they produce a flush of new orange growth. Ideal for containers and short periods indoors for the festive season. 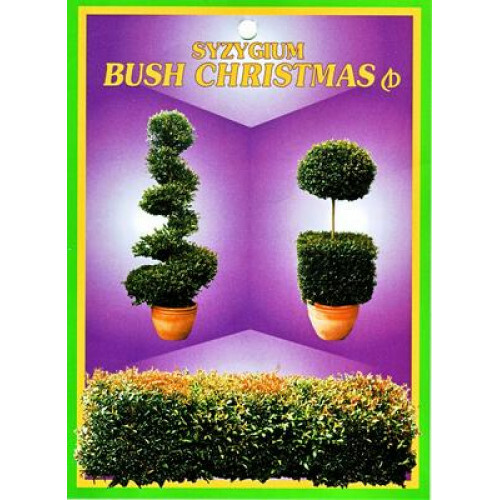 Excellent as stand-alone specimens or very low screening hedge, This is a slower growing form than another new release Syzygium, such as pinnacle or resilience. Can be damaged in severe frosts. However avoid the temptation to prune back immediately, wait until the threat of frost has passed and then trim. Will benefit from feeding twice per year with a complete plant food and liquid fertilizer. For further inquiries please use our free garden design service or email: store@onlineplants.com.au Available for fast delivery to your door in all Melbourne, Sydney, Adelaide, Canberra, and Brisbane, metropolitan and regional areas from our online plants store.